In the city of Van, not far from Turkey’s border with Iran, breakfast has been turned into serious business: the town is filled with dozens of Kahvaltı Salonu’s – breakfast salons – that serve a dizzying assortment of farm fresh breakfast items day and night. In recent years this superb breakfast has been working its way westward, with several Van-style spots now open in Istanbul. 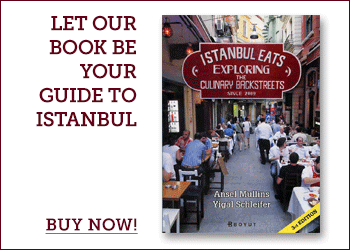 Our favorite is Van Kahavaltı Evi (Van Breakfast House) in Beyoglu’s Cihangir neighborhood. The restaurant has quickly become one of the area’s most popular, and it’s easy to see why. The people running the friendly place serve a mean breakfast, bringing in most of their ingredients, some of them organic, from back east. The Van breakfast takes the traditional Turkish breakfast of cheese, tomato, cucumber and some bread and turns it up several notches. At Van Kahvalti Evi, along with the standards, your breakfast plate comes with an assortment of local Van cheeses (including a very tasty one that contains brined wild herbs), kaymak (clotted cream), tangy cacik (thick yogurt spread) and murtuğa, a heavy wheat flour porridge that looks almost like scrambled eggs. Butter, jams, olives and some of Van’s famous honey round all this out – along with endless glasses of strong tea. At first glance, with its steam table covered with pots of ready-made food, Hayvore may look like any one of those quickie lunch spots found throughout Turkey. But there’s a difference – someone here is cooking up some serious Black Sea magic in the kitchen. The Black Sea area is Turkey’s culinary misfit – not really about kebabs or meze. It’s simple, filling, down-home food and Hayvore is a great spot to get acquainted with it. This time of year, the restaurant – found on a side street off busy Istiklal boulevard – serves a very tasty version of hamsi (fresh anchovy) pilaf, the holy grail of Black Sea cooking. A kind of savory fish cake, the pilaf has small hamsi filets wrapped around a thick bed of rice infused with herbs, currants and pine nuts. Everything else we’ve tried at Hayvore has been a winner. A rib sticking stew made with kale, beans and hominy was earthy and smoky. Hayvore also serves up a fine version of another Black Sea staple – creamy white beans (kuru fasulye) cooked up in a rich, buttery red sauce. On any given day, Hayvore has more than a dozen items bubbling away on the steam table, some typical Black Sea dishes, some not. It’s worth trying a few – it’s the easiest way to visit the Black Sea without leaving Istanbul. Baklava, the flaky, phyllo-dough based pastry, has long ago stopped being a Middle Eastern regional specialty. In America, for example, it is now a staple of dessert menus at diners and falafel stands across the country. But these places miss the point: baklava is actually not a dessert, but rather an event in itself. In Istanbul, Karaköy Güllüoğlu is one of our favorite places for an authentic baklava experience. Located a stone’s throw from the Bosphorus, this baklava emporium has been catering to Istanbul sweet tooths since 1949, serving than a dozen different kinds of phyllo-based sweets, none of them resembling the cardboard-like, past-its-prime version of baklava that is often dished out outside the Middle East. Along with the excellent classic baklava, we are also fans of a specialty called sutlu Nuriye, made of flaky layers of pastry drenched in a sweet, milky sauce. 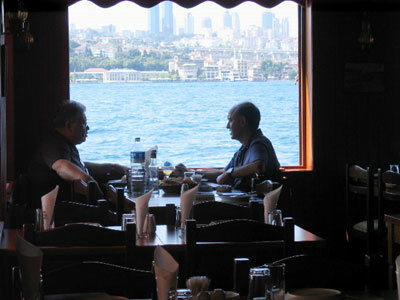 After ordering your baklava, sit down at a table outside and catch the Bosphorus breeze. We recently stumbled upon Antiochia – a small restaurant on a quiet Beyoglu backstreet that exudes cool without sacrificing flavor. From its funky logo to the hipster waiters, Antiochia clearly has a different ambition (and clientele) than most restaurants serving the Middle Eastern-influenced food from Turkey’s southern Hatay region, an area wedged between Syria and the Mediterranean Sea. Nar eksili cevizli kozbiber, a divine relish of red and green peppers in a pomegranate dressing, was topped with crushed walnuts, adding a crunchy texture to this sweet and sour cold starter. Tasting the homemade yogurt with mint proved just how little we knew about what yogurt can be — pleasantly sour and almost as thick as butter. Muammara, a thick spread of walnuts, red pepper and spices is a Hatay signature and a fine choice. Our favorite, though, was the kekik salatasi, an intense meze of green olives, fresh thyme and olive oil. Antiochia’s main courses are simple, recognizable dishes, yet set to a higher frequency. Şiş et is a plate of marinated cubes of beef skewered and grilled over a charcoal fire. On any given evening in Beyoglu, there have got to be thousands of skewers of şiş et coming off the grill, but none are quite as tender and succulent as the one at Antiochia. The minced meat wrap, an Istanbul street food favorite, with onions and tomatoes, was among the best we’ve had in the city. Perhaps we’re getting carried away, but kaymak can do that to you. For our money, the classic Turkish combo of kaymak served with honey and crusty white bread is one of the finest breakfasts this side of paradise. And one of our favorite places to eat this breakfast is Besiktas Kaymakci. This tiny shop/eatery has been in business since 1895, and it certainly shows its age. The marble counter is cracked and the paint on the walls peeling. But the kaymak, served up by the 84-year-old Pando, a Turk of Bulgarian origin and a living institution in Istanbul’s untouristed Besiktas bazaar, is out of this world. Prices here also seem unchanged since 1895: a plate of kaymak and honey, served with fresh bread and a glass of steaming hot milk, will set you back 4 lira. Most fish restaurants are mere caricatures of places like Ismet Baba, where traditions have been kept sacred for more than fifty years. This may not be the best restaurant in the city, but it’s got something most of the others have lost, keeping rhythm to an old school style of Istanbul charm and character. At Ismet Baba, located in Kuzguncuk, a charming Bosphorus neighborhood on the Asian side, we like to lean back, hunker down into a long raki-laced lunch and really enjoy this special place and its classic mezes. Pilaki, beans in olive oil, and the cold octopus salad are unusually good. We also like the haydari, a thick, tangy spread of strained yogurt and dill and the fried eggplant with a garlicky yogurt drizzle. The catch of the day is posted on a small black board in the dining room, and we found the grilled bream, cupra, or a plate of blue fish, cinekop, perfectly prepared and just the right amount. This funky informal restaurant, housed in an imposing Ottoman-era mansion located smack dab on the Bosporus in the swank Arnavutkoy neighborhood, serves some of Istanbul’s most creative riffs on traditional Turkish cuisine. The four floors of the building each have a very different vibe, from bar-like to intimate, although we suggest a table in the dine-in kitchen, up close and personal with Abracadabra’s spunky owner-chef Dilara Erbay, a pioneer of Turkish fusion cuisine. Through flaming woks, kitchen hustle and shouts, something smelling at once Thai, Turkish and Lebanese rushes past you for Dilara’s final touch. There’s a lot going on in this kitchen that you won’t want to miss. And when it’s time to order, we usually put ourselves at the tender mercy of Dilara, letting her guide us through the menu. Dilara’s navigation of the appetizer menu includes her latest inspired creations, prepared with what’s fresh in the markets. Like a jazzman interpreting on an old standard, Dilara hints at classic Turkish cuisine sometimes in little more than name, for example tweaking the classic börek into a bouquet of matchstick skinny, 6-inch batons served upright in a shot glass of sweet and spicy sauce, both beautiful and fun to eat. This is great! I totally agree about the Times coverage. It was pretty weak. I really enjoyed this post when you ran it a few months ago. I’d kill for some nar eksili cevizli kozbiber right now. I loved all the food I ate in Istanbul (over 10 years ago), this just makes me want to go back. Hi! I used this site to manouver through most of my 5 days in Istanbul, and it helped me immensely! From the unusual (to us) flavours of Antiocha, to the great fish at Ismet Baba, the perfect grill at Zubeyir. Thanks for all the helpful hints and keep up the good work! Thanks for the note Gustav! We’re really happy we could be part of making your trip a good one. Spread the Istanbul Eats word. Thanks for this post! I found the NY Times article to be very frustrating. 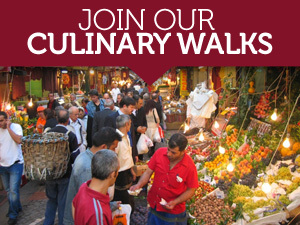 I know you don’t need to spend upwards of $60 per meal to eat well in Istanbul! 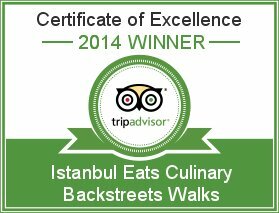 I am looking forward to my first six days in the city in mid-March and Istanbul Eats has been a terrific source of ‘real’ suggestions that won’t break the bank. That sounds wonderful! And I’m going to be in Istanbul for only a little over 48 hours. BUT! I am going to be in Sultanahmet with a tight schedule of tourist stuff (Blue Mosque, Topkapi, etc.) to do. Do you have any suggestions about that area? I would love to have the kind of food you described in your post; I am uninterested in French food, no matter how exquisite. Jerry, take a look in our “advice” section — we have a post dealing with just that question. Have a great trip. Fine again, but where is Oteller sokak ? Oteller Sokak is a small street that runs just next to the Maramara Pera Hotel and leads towards Asmalimescit street. Another way to find it is to go to the Pera Palas hotel and then ask for it. It’s one street in front of the Pera Palas. Thanks for the tips, which proved to be excellent. I would add Ciya Sofresi in Kadikoÿ. And many, many low-key places where they serve well-prepared, fresh produce. In Istanbul, you can have a superb fish meal for 2 for 7 euro..amazing. Thanks for the tips guys. Breakfastwise, Van Kahvalti Evi is a hit (albeit a little rushed off their feet). Pando in Besiktas is a miss… Breakfast plate was obviously prepared the day before because the cheese was dry and the tomato and cucumber slices stale. We got there 8.20 am, at 9am Mr Pando horrified us by grumbling at us to hurry up becuase people were outside waiting for a table.